A report – and a job ad – have popped up suggesting that in the wake of its aborted multi-billion-dollar Slack acquisition, Microsoft's gearing up to roll Slack-like capabilities into Skype. News that Skype will slack off broke at MS Power User. While The Register can't verify the details in that post, it's clear that Microsoft is working on something, because it's been looking for developers to work on the project. The ad says Skype Teams “is the future of collaboration and messaging”. 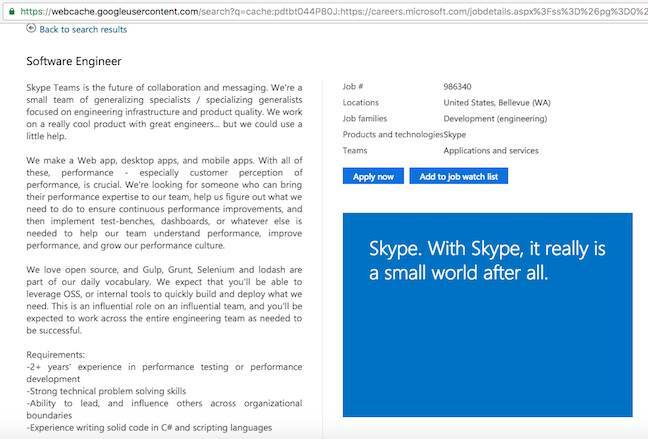 The role has been filled, it seems, and unfortunately this particular job was for someone to work on Skype Teams performance, rather than features in the product (that was quick: Google believes the ad was placed on September 3). Such a move would be in line with Microsoft's recent re-shaping of Skype, replacing its peer-to-peer model with a client-cloud structure. Skype's direct message capability is already a handy enterprise-friendly feature, but the MS Power User report says Redmond will also add user groups – Channels in Slack-speak. To give Skype an edge on Slack, the report says there'll also be threaded messages. There'll also be in-channel Skype calls (as well as private calls, naturally), and calendar integration.